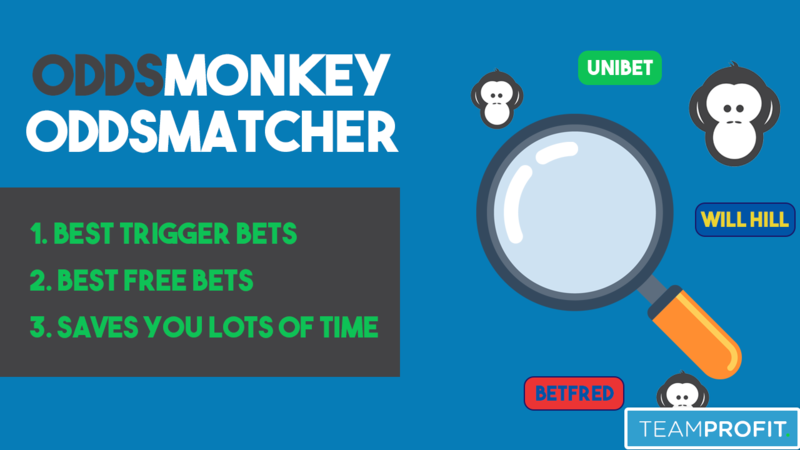 You may have heard about the OddsMonkey OddsMatcher, it is in our opinion a brilliant matched betting tool that makes you more profit and saves you time too. In this guide, you will learn the 3 key benefits and when you should consider using it. OddsMatcher Special Offer - £1 for 1 Week! Special OddsMatcher Offer - £1 for 1 Week! After your £1 for 1 week trial has finished, you are moved to £17.99/month subscription. Most members find this great value, however, if you don't think you will, no problem at all, just cancel your subscription before your 1 week has finished! The Oddsmatcher automatically gets the odds from the bookmaker and the exchange and compares them, and then displays the best trigger bets to you! From the screenshot above, you can see the best trigger bet for William Hill on Scotland to win with back odds of 1.8 and lay odds of 1.82. The rating 96.61% shows you that with a £10 trigger bet, you will retain £9.66, meaning a trigger bet loss of only 34p. Often in the OddsMatcher you will find 98% to 99% teams for a tiny trigger bet loss. The Oddsmatcher automatically shows you the team or horse with the highest profit from your free bet. You can see this in the 'SNR %' column. You can set the maximum back odds (e.g. 5.0 max back odds) to ensure you can cover the liability with your exchange balance. From the screenshot above, you can see the best free bet for William Hill on the horse Incus to win with Lingfield 12:10 odds of 9.0 and lay odds of 9.6. The SNR% of 81.84% shows you that with a £10 free bet, you make a £8.18 profit. In the OddsMatcher filter you can set max back odds (e.g. 5.0), in which case, Russia to beat Sweden would show as the best free bet with odds of 4.33 and lay odds of 4.6. The SNR% of 71.25% shows you that with a £10 free bet, you make a £7.12 profit. In addition to saving you all the time to find the trigger and free bets teams, you also save time as you can go directly the exchange market in one click. Just click the arrow to the right of the Betfair Exchange logo and you will go straight to the market. You can try out OddsMonkey Premium for just £1 for 1 week unlimited access so you can check it out for yourself! You can cancel your subscription if you're not enjoying it in your first week, otherwise at the end of your first week you will be moved on to OddsMonkey Premium which is £17.99/month. This is great value as a matched bettor as OddsMonkey will make you much more profit than this cost. I would recommend having a £100 bankroll before signing up to the £1 for 1 week trial. This is so you can comfortably cover the cost of the £1 trial and then the £17.99 first month payment (unless you cancel in your first week) without it impacting your available funds. If you have less than £100 currently, you can still sign up for an OddsMonkey Free Account and try the OddsMatcher for Coral and Betfred. If you are not enjoying your OddsMonkey Premium account during the 7 days, just cancel it in your OddsMonkey account and you won't be moved on to the £17.99/month plan. Likewise once you've started the £17.99/month plan, there is no commitment you can cancel it anytime and you won't be billed again.